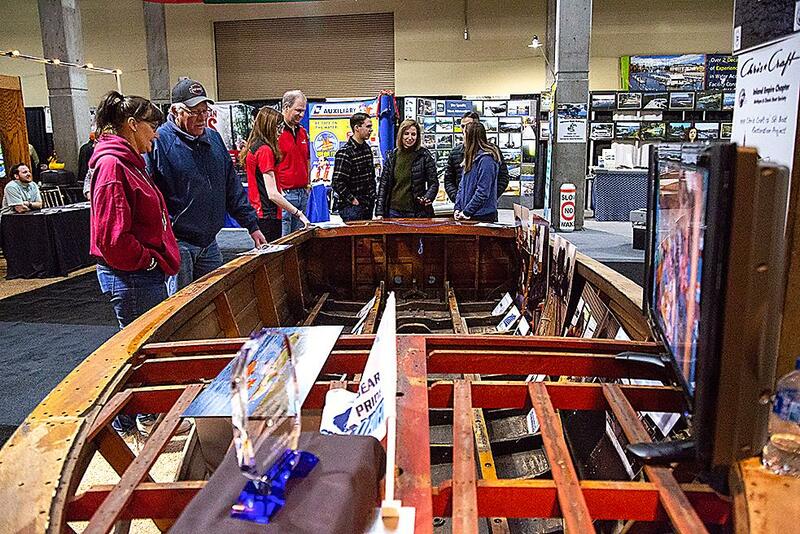 UPDATED: Mon., Feb. 4, 2019, 6:28 a.m.
Miranda Kuhlmann, one of a small group of high school students gathered around a stripped, mahogany boat frame at the Spokane Boat Show, said she hopes the 60-year-old boat will be completely restored to its former glory when her club returns to the boat show next year. The boat was purchased for about $1,800 from a member of the Inland Empire Chapter Antique and Classic Boat Society, and the Central Valley SkillsUSA chapter aims to auction it off for about 12 or 13 times its original price, she said. The proceeds will help the Central Valley SkillsUSA club, a group that helps students gain occupational skills and pay for state competitions, which can cost about $300 per student. Kuhlmann, a junior at Central Valley High School and the SkillsUSA president, said that last year, she barely scraped money together to attend a state competition and hopes that in the future, the club will have the money to create in-house scholarships for Central Valley High School students who would like to compete. Sponsors will have their names on the final boat and many people have helped them purchase basic supplies to restore the craft, she said. She said she hopes that with 10 people working on the boat, they’ll be able to finish restoration and take it on its maiden voyage at a local lake before next year’s Spokane Boat Show. The 17-foot 1959 Chris-Craft Ski Boat was one of the few boats at the Spokane Boat Show on Sunday that were not for sale. Most of the other boats on display cost between $20,000 and $200,000 and included various special features for luxury boating, fishing or skiing. Fritz Sander, a salesman for Tobler Marina in Hayden, said some people stopping by the boat show were shopping for boats, but many were looking at the latest trends. The most popular boats right now are pontoon boats and surf boats, he said. Pontoons, in particular, are some of the best-selling boats in the country: They can be used for water sports, but most boaters have a more “floating in their living room” experience, he said. Many people stopping by the boat shop already know what they’re looking for, they just want a chance to look and sit in the driver’s seat, Sander said. Scott Thompson, Spokane Boat Show manager, said there likely would be millions of dollars in sales over the course of the boat show. He said about half of the boat sales in the area go through the Spokane Boat Show, and people also connect with providers of gear, supplies, accessories and marinas. The show lasts for nine days, many of which are themed and have special attendance discount days, such as Military Monday, Women in the Water Wednesday and Zag Thursday. The show started Friday and runs through Saturday. Published: Feb. 4, 2019, 6 a.m. Updated: Feb. 4, 2019, 6:28 a.m.